More than 90% of the Universe contains material of unknown composition. We know this Dark Matter exists, and the only way we can identify it is by its affect on known objects. Black holes, brown dwarfs, white dwarfs and other massive objects only equal a small percentage of unseen matter. Hot dark matter is thought to be near zero-mass moving near the speed of light. This can be relativistic moving massive neutrinos. Cold dark matter compose of more massive particles moving slower than the speed of light. One interesting effect of Dark Matter surrounding a galaxy is that objects that lay behind the galaxy in the line of sight of an observer will witness what is called a gravity lens. The mass of the galaxy itself is not enough to affect the light from the distant object, but Dark Matter can. Computer simulations are very important in determining the role of Dark Matter and the formation of the structure of our Universe. As discussed earlier, galaxies exist in clusters and clusters are members of superclusters. All of this is held together by Dark Matter. When astronomers use computers to map Dark Matter, the result is something like this image on the left. This particular frame is a simulation of both Cold and Hot Dark Matter. 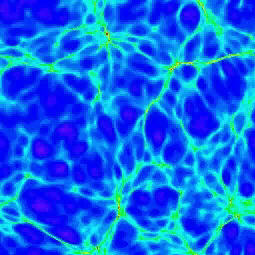 The stringy material in the simulation represents the distribution of galaxy superclusters. This is in agreement with what we observer. For a simulation of Dark Matter, click the image on the right. This video shows the gradual formation of structure as time progresses. This particular video shows a simulation of Cold Dark Matter (video care of Swinburne Astronomy Online). The problem that astronomers face now is attempting to determine if Dark Matter is Cold, Hot or both. There are two major theories as to the structure of our Universe, and each depends on either Hot or Cold Dark Matter. Data is still being collected and debates are sometimes very heated.